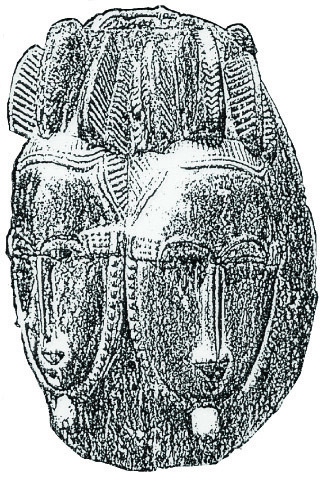 Origin: Yoruba, Nigeria. In legend, this mask has three or distinct stories behind it. One say it represent twins which were often looked upon as deities. Some same the mask represents the feminine side so it must represent the women that was said to be behind this image. The third says the masks faces in opposite directions because each side sees things from different points of view. For example, one side is beauty and the other beast. One side spirit and one side nature. The natives believe the ultimate is that these masks represent the marrying of these sides into one. I like the latter, since I think we all possess both sides. I usually do this mask with a white irridized face and a black face. I have done many different color combinations and am open to doing so again. This mask has a center section of irridized translucent glass and is highlighted with many, many different colors. If it were in our closet we could say, "Goes with everything."